On 24 October 2016, Cyrus was in his Bombay House 4th floor office examining what seemed like a routine agenda for the Tata Sons board meeting that was scheduled to start in five minutes at 14:00 hours. Through the grapevine, Cyrus had heard that some of the board members had an unscheduled informal meeting earlier that morning. However, what they had discussed was unknown, and as such, he did not give it much further thought. The previous week had been business as usual with trips to China and Singapore to meet partners and investors. A knock on the door, and to his surprise, enter his predecessor, Ratan Tata and Tata Sons board member Nitin Nohria. Cyrus welcomes them and asks them to take the two chairs opposite him. Nitin Nohria begins by proclaiming that “Cyrus as you know the relationship between you and Ratan Tata has not been working.” Therefore, Nohria continues, Tata Trusts have decided to move a board resolution removing Cyrus as Chairman of Tata Sons. He is offered the option of resigning or facing the resolution for his removal at the upcoming board meeting. Ratan Tata chimes in at this stage to say he is sorry that things have reached this stage. Cyrus Mistry calmly responds with gentlemen you are free to take it up at the board meeting and I will do what I have to do. Nitin Nohria and Ratan Tata exit the room and walk over to the other end of the hallowed 4th floor of Bombay House, where the board room is located. Cyrus, sends a text “I am being sacked” to his wife Rohiqa, before putting on his jacket and heading to the Board Room. Cyrus takes his place on the chairman’s seat, a chair that is slightly elevated and larger compared to the other chairs in the room. Mistry welcomes Ratan Tata (who had never attended a board meeting since Cyrus had become Chairman) to the meeting and informs the board that Ratan Tata and Nitin Nohria have something to share prior to considering the previously circulated agenda. Nohria, a Tata Trust nominee and Dean of Harvard Business School, advises the board that the Tata Trusts have asked its nominees to propose a motion to the Board of Tata Sons. 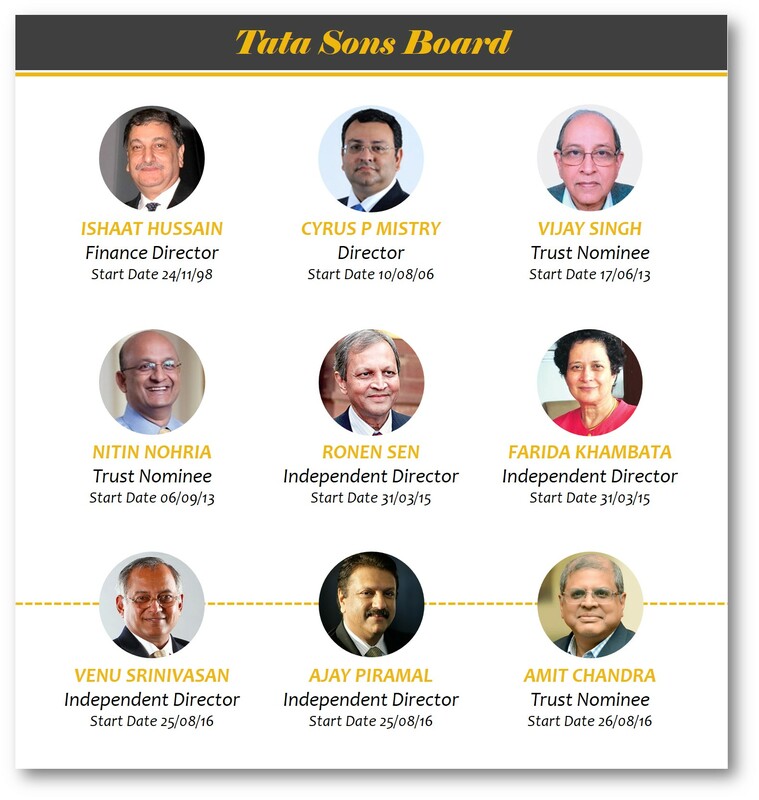 Amit Chandra, another Tata Trust nominee, apprises the board that at a meeting of the Trust Directors held earlier in the day it was agreed to move a motion to request Mistry to step down as Executive Chairman of Tata Sons because the Trusts had lost confidence in him for a variety of reasons. No rationale for the decision beyond this declaration was shared. In response, Cyrus argued that the articles of association required a 15-day notice before taking up such an item for the consideration of the Board, and as such, the present action was illegal. Amit Chandra informed the board that the legal opinion obtained by the Trusts stated such a notice was not necessary. He offered to share the opinion, but none has been to date. Instead, he proposed Vijay Singh to be elected as the Chair for the remainder of the Board Meeting. Despite repeated protests by Cyrus on the illegality of events, Venu Srinivasan seconded the proposal. Ishaat Hussain and Farida Khambata said they would abstain on this motion to replace Mistry with Singh as Chair of the meeting. Quickly, a vote was taken with six members (Ajay Piramal, Amit Chandra, Nitin Nohria, Ronen Sen, Venu Srinivasan, Vijay Singh) voting for, while Farida Khambata and Ishaat Hussain abstained. Vijay Singh was installed as Chair for the meeting. Until selection and appointment of a new Chairman of the Board in terms of the Companies Act, 2013 and the Articles of Association of the Company, to vest substantial powers of management of the Company with Mr. F. N. Subedar, Chief Operating Officer, and/or one or more senior officials and/or Directors of the Company, subject to the overall supervision and direction of the Board, in such manner as the Board may decide from time to time. Each of these resolutions was voted on in turn. While different board members proposed and seconded the individual resolutions, the voting pattern was identical across them. Khambata abstained on each, Mistry objected to each as being illegal, while the others voted for them. It was all over in minutes, no explanations and no opportunity for Cyrus Mistry to prepare a rebuttal. By 15:00, Cyrus had returned to his office and begun packing his personal effects. He queried Subedar on whether he needed to return the next day. Subedar checked with Ratan Tata and reported that it was unnecessary. Cyrus then called his childhood friend and top notch lawyer, Apurva Diwanji, to help him. Apurva arrived within ten minutes and asked for the Tata Sons’ articles of association. Apurva realized that the press would invariably be gathering outside Bombay House making an exit challenging. Apurva needed a safe place for Cyrus to be taken as the press would be lying in wait outside the Mistry residence. Jai Mavani from Shapoorji Pallonji, the family firm of Cyrus, was given a call to organize this. Jai knew that the Forbes, another Shapoorji Pallonji related company, had its headquarters in the neighborhood on a quiet street. Apurva exited via the side entrance of Bombay House, which was rarely used, to whisk Cyrus to the designated safe place. The conference room is where Cyrus first got a chance to sit down, visibly shaken, and asked for a cup of tea. They knew they needed a public relations agency and a lawyer immediately. What they did not know was that Tata had already engaged six major public relations companies and booked many of the most prominent lawyers in the country in a bid to squeeze the resources available to Cyrus post firing. “Mumbai: Tata Sons today announced that its Board has replaced Mr. Cyrus P. Mistry as Chairman of Tata Sons. The decision was taken at a Board meeting held here today. The Board has named Mr. Ratan N. Tata as Interim Chairman of Tata Sons. The Board has constituted a Selection Committee to choose a new Chairman. Immediately, the news broke across all TV channels in India and spreads like fire on social media. It was also reported that three members of Mistry’s top team had been asked to put in their papers. While not the Chairman of Tata Sons, Mistry was still a board member of Tata Sons and the Chairman of the Board of Directors of most of the major group companies. The media started speculating whether Mistry would step down as Chairman of these companies. This was intriguing since the first board meeting coming up was for Tata Global Beverages Limited (TGBL) to be held on 26th October at Bombay House. CEOs being fired is always news, despite it not being a terribly uncommon occurrence. What made the firing of Cyrus Mistry so unusual was that Tata Group had a history of only six Chairman over 148 years! Cyrus Mistry was selected after a careful process that took over a year, and by assuming the role at the age of 46, he was expected to serve between 20-30 years. In general, the Tata group is renowned for its values, which did not encompass a “hire and fire” policy. Most senior Tata executives were consummate insiders, having usually served their entire career with the Group. The initial contract under which Cyrus was serving as the Chairman had been passed via a shareholder resolution of Tata Sons. It was due to expire on 31 March 2017. Instead of the sudden, no warning dismissal, the board could have just let the clock run out in five months. By eschewing the public humiliation of Cyrus Mistry, the bloody aftermath that followed could have been avoided. Unfortunately, instead there was the subsequent public airing of the underbelly of the Tata group as well as the deleterious impact on the reputations of Ratan Tata, Cyrus Mistry and the Tata brand. The only winners as far as one could see were the public relations companies and lawyers, who are still having a field day. On taking over as Chairman, Cyrus had taken a year to put his leadership team in place. 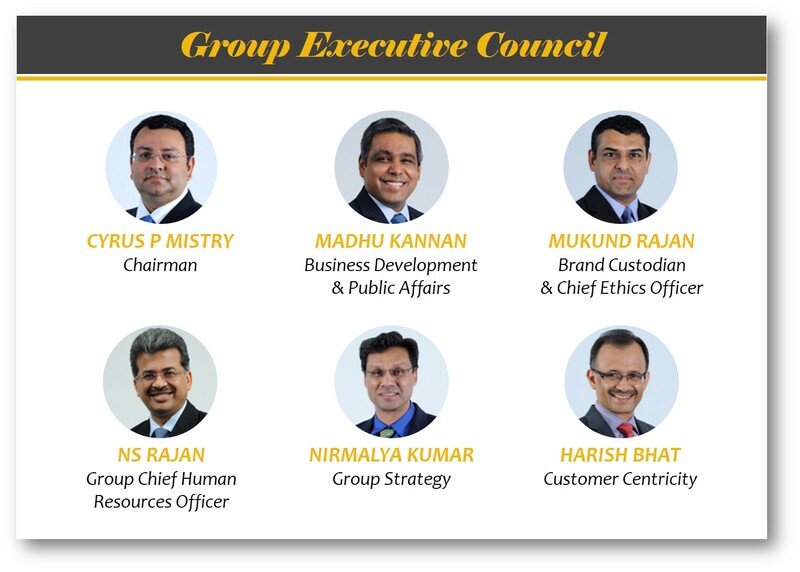 Called the Group Executive Council (GEC), it comprised of two old Tata hands and three people recruited from outside the group. I was hired to head strategy for the Tata group, a position that had required me to intensively interact with Cyrus as we formulated Tata’s strategy until 2025. On the morning of 24th October, I recall asking Cyrus if he needed my help with the board meeting. I only attended Tata Sons board meetings to support Cyrus. This was when formal presentations on group strategy were scheduled, usually during the longer June and December meetings. Since governance rather than strategy was on the agenda, Cyrus said he could manage on his own. Anticipating this, I was scheduled with two of my GEC colleagues, Harish Bhat and NS Rajan, to be on a panel and take questions from around 100 young Tata executives on the group’s big data initiative. At 14:50, we reached the Taj Hotel President property in Mumbai where the event was being held, completely unware of the events at Bombay House. Our panel was being moderated by Deep Thomas, CEO of Tata iQ, the big data company. Enthusiastic participants were quizzing us. NS Rajan was looking at his phone and unexpectedly walked off the podium. He returned a few minutes later, ashen faced, and whispered in my ear that the Chairman has been asked to step down. My head jerked – what? But I was on a panel so kept answering the questions, but signaled to Deep that we needed to wrap this up early. NS looked very distracted and flustered so I fielded any questions that came his way as he soon left the podium and the room. We walked out into the hall and NS Rajan informs Harish and me that his understanding is that with the Chairman, all three of the outsiders on the GEC have also been let go. I invited them to my apartment for a drink rather than return to the Bombay House until we gathered more information. Harish, as was his style, kept reassuring the two of us that firing of Cyrus and the three GEC members was very unfair. We turned on the television, and all the Indian television channels were plastered with Cyrus Mistry and three GEC members of Tata being asked to leave. By 19:00 both my fellow GEC members had departed. I was unable to get hold of Madhu, usually my most reliable source of information. Finally, Ishaat Hussain responded by asking me for a drink at his place at 19:30. Ishaat was clear that he had no idea this was going to happen. He had entered the board meeting a few minutes late. Subedar, standing outside the boardroom, with a white face, had informed him that Cyrus was being fired. At 21:00, I got a call from Subedar, with whom I had worked closely and got along rather famously as we were often on the same side of arguments. He came from a finance background and I being a rational business school academic, both pushed for greater capital efficiency and performance orientation. Anyway, on this call, he simply said: “it is my unpleasant duty to say your services are no longer required”. No explanation. I queried does this mean I did not need to show up tomorrow morning? An affirmative reply, and that was it. Madhu and NS received similar calls. A few minutes later, Cyrus called. His voice was even lower than the usual soft spoken tone: Nirmalya, please let us finish dinner and then can we meet at my residence around 22:00. I summoned my chauffer and told him to quickly have his dinner as we may be in for a long night. It was the start of a furious two months, where I worked harder than ever with Madhu to help Cyrus wage a battle against the enormously powerful Tata machine until it moved to the courts. Many of you have read my blog of the week following my firing entitled, I Just Got Fired! The year that has passed required me to dig deep, but that is a story for another week. Let me just conclude that a year later, despite the best efforts of the press promoted by the six PR agencies and pressure from the internal Tata communications team, only two Tata CEOs, Bhaskar Bhat and Harish Bhat, have had anything negative to say about Cyrus Mistry in the press. And, even they, were remarkably muted in their criticism. Under the circumstances, what better performance review could Cyrus Mistry have received as Chairman of Tata Sons? Previous Post How Should Business Engage with Sustainability? Next Post Are Independent Directors Independent? Opens a new vista on the events. Taking someone unaware, not giving them the chance to counter, not acceptable. Some questions are not answered or do not have an answer. Cyrus ouster is one of those. Anyway on the hindsight Cyrus’ loss is Chandra’s gain and that is how it is. Cyrus Mistry is a very wealthy man so does not need our emotional support. But Tata Sons controls vast assets and directs the lives of many. The event described was not a sacking but an execution. The only justification for this would be some shockingly ghastly deed perpetrated by him; no such smoking gun is visible as yet. Nitin Nohria’s acquiescence does not speak well of the world famous business school he heads. Cyrus Mistry decisions were not politically correct. Is this not enough reason? It is sad that a Gentleman is sacked without giving any reasons, not allowed to defend and probably for being honest, grounded and ethical professional. Cyrus Mistry, please continue to be a good human being. It’s no surprise on what motivated the events. Tata steel – corus and Nano were decisions that Cyrus was right in acknowledging. That didn’t go well with someone’s inflated ego. I hope Cyrus puts up a good fight. 1. I was shocked at the decision of Mr. Ratan Tata and the Board. Having worked for Tata, I was not happy the way news anchors were discussing the subject ( CNN News 18) as a viewer on the fateful evening. 2. I am shocked at the current state of Tata Motors and the way Transformation journey is being handled. In short , recipe for disaster. 3. Personally, I wish that one from family of Tata would be the Chairman. However good the CEOs of Tata Companies were or would be. It was a legacy and the idea of “our” Chairman being from Tata family is time honoured tradition. To depart from this requires much higher necessity. 4. I can write series of blog posts, but the damage is irreparably done. Wonderful insiders view on the whole saga sir! Thanks for opening up and sharing the story, otherwise we will never know the story from the other sides! what was the legal stance. All what happened I feel is because of the breakdown in communication between Mr. Mistry and Tata Son’s. In key area the promoters must be kept in loop. This might have not done by Mr.Mistry. It just shows that if you have means and hold dominant position you can blantly abuse these powers and even the most inteligent person are either become mute spectator or mere executioner of these type of decision. After working in Govt. and Pvt organisation I can only say there is no hope that an individual whatsoever postion he hold in these organisation can change the system unless these system are intended to do so. At the sametime I feel how could we missed our six sense that something wrong is going to happen with us or we become too complecent.In corporate things are not detroriated in one day. Feel very sad for Mr. Cyrus Mistry. From your narrative, it looks like Cyrus (and his core team too) was deep into his work of restoring the glory of Tata companies and not bothering about “noise” around but this character of Cyrus has been badly exploited by Ratan with help from his “traditional” friends in PR agencies/media. Cyrus obviously does not deserve any of this but feel there is no point in fighting this as well. As you have said in your article, Cyrus has admirers within Tata group and a lot outside and he can focus completely on his own group and be much more successful (I know he does not need my advice, still!). Karma will take care of the rest, for sure. Thanks for sharing this, very valuable life lessons indeed. It’s shocking, even the CEO was treated below par. It’s a classic case of corporate cruelty without giving a fair chance to the employee yeah here it was Chairman. I have seen much worse firings where the new head walks in to office one fine morning and then the old guy is informed of him being replaced. Or when during a party for senior managers in a hotel , the replacement walks in and everyone gets to know of the change. Oh! So why are your comments appearing, grow up and stop blabbering in matters where you don’t have an iota of knowledge. Thank you. He/she kept posting comments as above, which were not supported by evidence so removed them. Will let this one be as summarises the many attacks on me. I tried in my blog to present the facts as much as possible so can be used as a case study in corporate governance courses. Can you share why Mr Mistry was fired? Why was his relationship with Ratan Tata in the doldrums? Do you know “why” Cyrus was fired? If yes, please write about that. Everything else is less important. Na baap bada na bhaiyya…..sabse bada ruppaiyah ! !……goes the age old saying. In the current age of short term public memory, even reputation can be kept at stake…!! This article did not give any details beyond the masala. What was the legal opinion? Why was he delt with such dishonor? What made Tatas break their 150 yrs of legacy ? I really thought there was more insight beyond reading the events of that particular day and where you had drinks. I am a IIT, IIM grad. I worked for TCS (a tata company). I found that only mediocre and below average people work in tata companies. People with government employee mindset. I am bright and high performer. Quit TCS within 3 months. HR staff is worst in any tata company. They recruit losers for HR jobs. Pity it dint work for you. Hows that TCS has grown to be the biggest Indian IT Company, and continues to do well? One among top 10 private sector employers globally? It started a bad precedent and the same was followed by Infi. Indian boards need “Ji Huzoor” kind of CEO’s dancing to the tunes of the promoters. Otherwise, you are fired. Times are changing so are corporate ethics. The fault I see is with the team Cyrus Selected. Tata group had a massive opportunity to be a market leader with Multiproduct offering. But instead they were closing down non performing units like Telecom. I think Cyrus missed the trick but sacking was unethical by Tata standards. Are you saying N Chandra is Ratan’s yes man?? You told us how . but why ? it is still not clear . I really do not know what were the crimes committed by Cyrus that called for his unceremonious and instantaneous removal. I have huge respect and admiration for the TATA group like millions of others do for the respect they give for business ethics and their invaluable contribution to our country. BUT, this incident hardly matches with that reputation. Highly unceremonious removal of their top man like you are kicking out a casual labourer, that too without giving him adequate time and opportunity to defend his case, has definitely shocked the entire nation besmirching their reputation. It will take a long time to obliterate this blemish. Some recents events in corporate India has shown the ex chairmen has failed miserably in following the Indian tradition of SANYASHRAM,TATAS is one of them..
An interesting live case study for business schools indeed ! It might have been unfair on the part of Tata Trusts to not give a timely notice to Mr. Cyrus Mistry. Also as you rightly pointed out that this was a premeditated action , and Tata Trusts had already engaged the major PR firms and lawers. Now lets us look as why they did so ? They did it perhaps as they were expecting Mr. Cyrus Mistry to wage a battle. And he did prove them right. Didn’t he ? However there is one thing still makes me wonder “how”. The question is that how on earth was Mr. Cyrus Mistry unaware of what was coming his way. To an naive reader like me , it tells me only one thing , that as a Chairman he didnt have a good understanding of the situation and the circumstances he was dealing with. To put it in simple terms, he failed to understand which way the wind was blowing . That is a serious flaw when you are working as a chairman. Now I know there would 1001 reasons and counter arguments for that. But I am not arguing , just stating a fact. Such actions are always pre planned, concerted with help of few hired loyalist !! It is shame on all!! Nice story but no facts and figures were given. Tata is not that stupid to fire anyone particularly the chairman for no reason. The manner in which it is done is not correct. However I know the plight of IT workers in TCS. Pathetic with no basic rights to utilize even use their earned annual holidays. They try their best to keep the stock markets and customers happy than their hard working employees. Stress levels are too high and no work family balance. As a leadership consultant, coach and former practitioner I see three key takeaways from this unfortunate corporate accident so to say! 1. Was Cyrus Mistry, apparently a man of integrity, the right selection to be head of a salt-to-software conglomerate ? Did he truly have adequate capabilities? Or was it a compromise to fit-in a “Tata family” member which eventually led to a huge cost of leadership mis-hire?! 2. Tata is an ‘oak’ tree in corporate India known for its values and ethics. Could it have done the exit better – say ‘severance with reverence’?! 3. Mr. Nirmalya Kumar, it’s not in good taste to share ‘dressing room’ talk in public and making it an anniversary event or something! To conclude, let’s treat it as unfortunate ‘history’ and not get into a character assassination of either the leader or the oak tree!! Narrative by a non board member is likely to have some conjecture, and this is not the officially Board minutes. It is more than obvious that a conspiracy was hatched by all powerful Ratan Tata to viciously and arbitrarily expel Cyrus Mistry for reasons best known to Tata and Tata alone! It may have been envy, jealousy, clash of egos and personalities, because Cyrus outdid RT as CM with bold decisions to liquidate, as any business person would, Non Performing Assets, thus reducing drain of losses to Tata Sons! All such NPAs initiated by Ratan Tata, were causing crores worth of losses! Maybe this bold move by Cyrus to liquidate such NPAs, exposed and ambarraced Tata for his poor judgement and evaluation of projects that never took off! Hence a conspiracy had to be hatched behind closed doors expel Cyrus! “Reluctantly”, the meak Board Members with Tata’s clout were forced to pass and second the resolution! Those who didn’t fall in line were shown the door! Fearing more disclosures of poor judgement, only way out was to expel Cyrus without reason or chance for a rebuttal! Curiously enough, Tata promised £5 billion over five years to Kores Steel of UK, in spite of the fact that It was a loss making Company from day one! It is no wonder that billionaire Mittal having steel factories around the world, would not touch Kores with a barge pole! What’s more, Ratan Tata was honoured by UK Govt. for saving the Kores workers from redundancies! Cyrus Mistry was removed unceremoniously for no reason at all! His continuation as CM of Tata Sons would have brought greater success and prosperity to the Tata Group of Companies!